Tel Burna's spring 2011 season has begun in earnest - the last three days have seen the Master's College IBEX program (Israel Bible Extension), a pre-military group of Israelis from Kibbutz Beth Guvrim, and several other volunteers continuing the work started in last summer's inaugural excavation. The first two days of the excavation have been summed up on Tel Burna's blog by the co-director of the site, Joe Uziel, they can be viewed here and here. The finds thus far have been rich and are beginning to illuminate some of the stratigraphic layout of the site. Our current excavations are being carried out in two main areas - Areas A and B. In Area A we are continuing to uncover remains from all of the Iron II with high concentrations of architecture and pottery from the Iron IIc (7th cent. BCE). The discovery of the 7th cent. at Burna, at the very least, allows the site to continue to be considered near the top of the contenders for the identification of biblical Libnah. Its presence shows that the site was occupied during the time of Josiah who married a certain "Hamutal...of Libnah" (2 Kings 23:31; 2 Kings 24:18). Additionally, we have continued to expose the eastern course of the Iron II fortification walls - it is our hope that this season will reveal the different phases of this massive fortification. 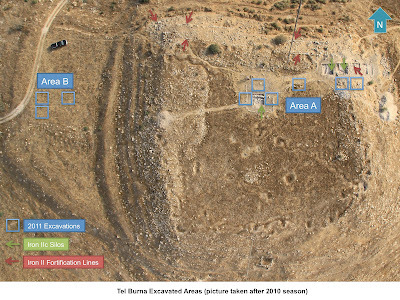 Based on our surface survey of Area B (Shai and Uziel Tel Aviv 2010) we were expecting to find primarily Late Bronze Age remains (1550-1200 BCE) on the western platform - the results have not disappointed. So far the vast majority of the pottery excavated in Area B dates to the Late Bronze Age. It's always nice when survey results match excavation results. 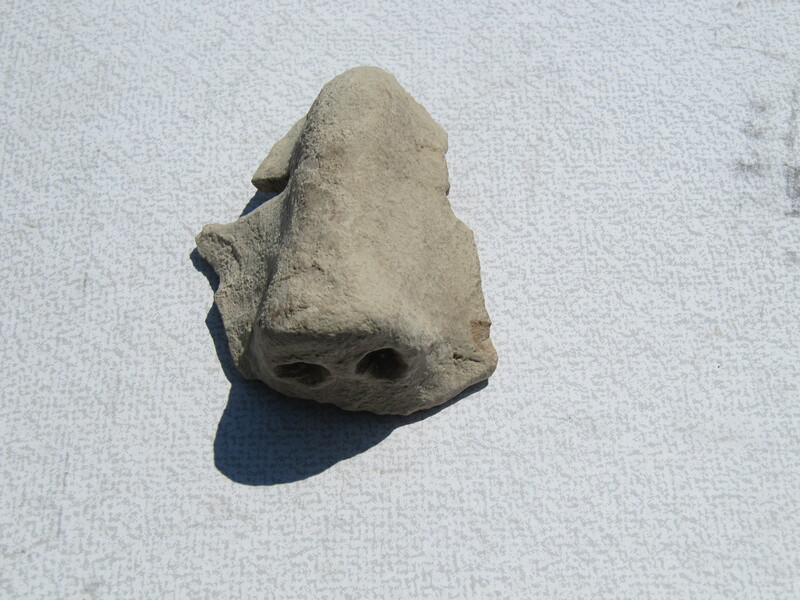 On a more exciting note there have been several special discoveries in this newly opened area - including a rather unique find - a ritualistic mask with a very large nose and eye holes, a well-crafted stone dish, and a nice tabun/tannur. Excavations will continue through the end of next week and will be renewed this summer on June 12-July 1 - see here for registration details.